Her last name might be familiar to you; “I come from a rather famous family”, Victoria Hearst humbly admits. “I’m very blessed.” She is the granddaughter of legendary newspaper publisher William Randolph Hearst. She is the youngest of five daughters born to Catherine Campbell and Randolph Apperson Hearst. Victoria and her sisters were raised Catholic, and growing up, attended parochial school. Victoria reminisces about her grade-school ambitions, and how at one point she even desired to be a nun. But as Victoria got older, and was looking toward the future, she began to aspire towards a career in show business. She had always loved singing, acting and dancing, so when she came of age Victoria did what most aspiring performers do – she moved to Los Angeles. She recalls how horribly he treated her. She was so miserable that she couldn’t get out of bed. Their relationship finally came to a head in December 1995. One night as she lay on the floor of their New York apartment, Victoria tearfully confessed to a friend that she had hit rock bottom. This friend had been taking care of Victoria’s Colorado home at the time, and simply let Victoria know that there would be a Bible waiting for her when she arrived. She got on the airplane broken-hearted, weeping all the way from New York to Colorado. When she got to the house she picked up the Bible that was there waiting for her and for five days straight she read and cried, read and cried. Victoria says that she always knew that God was in her life. She knew that if she started to stray, His hand would be there to bring her back. “But I wasn’t living my life for Him” she admits. From then on Victoria decided to live her life for God. In 1996 God led her on her first trip to Israel. She had been watching a Christian television program about Israel, and it sparked a desire to visit the holy land. In Israel she met Dr. Billye Brim who became her mentor, and over the years, visited Israel many times with Brim. One of their trips was in 2005, prior to the Disengagement from Gush Katif. It was a tumultuous time in Israel. Israelis were protesting while the residents of Gush Katif themselves did not know if they should prepare for the inevitable or hold out in the hope that something miraculous would happen, and they would be able to stay in their homes. 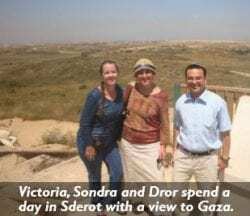 During that trip, Victoria, who was terribly troubled by the land concessions that Israel was about to make, visited Gush Katif and met with Dror Vanunu. 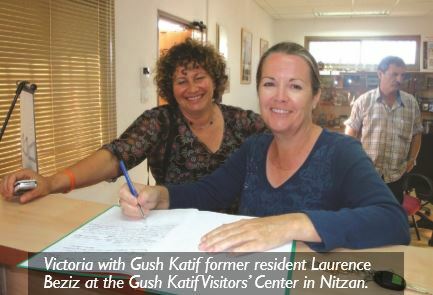 Dror, then spokesperson for the Gush Katif communities and a longtime partner of CFOIC Heartland, introduced Victoria to CFOIC Heartland Director, Sondra Oster Baras. Victoria and Sondra hit it off from the start, and the encounter marked the beginning of a wonderful relationship. Victoria created Praise Him Ministries in 2001, which, among other things, became a vehicle for promoting Israel. In 2009, Victoria invited Sondra and Dror to speak at a Night to Honor Israel at the PHM center in Ridgway, Colorado. The event took place on a Saturday night and Sondra, Dror, and Kim Troup, director of CFOIC Heartland’s US office, spent Shabbat with Victoria and other friends who had come for the special event. Sondra and Dror led a traditional Shabbat meal, complete with kosher food, Hebrew songs and blessings and a wonderful atmosphere. At the event on Saturday night, Victoria introduced CFOIC Heartland to her wonderful audience of Christian Zionists. One of Victoria’s fondest memories of Israel is her February 2011 visit. Sondra took Victoria to visit communities all over Judea and Samaria. She had been to Ariel before, but had never really spent time in the smaller communities of Judea and Samaria. During that trip she visited the communities of Karnei Shomron, Itamar, Ofra, Efrat, Kfar Etzion, Nokdim, and Tekoa. 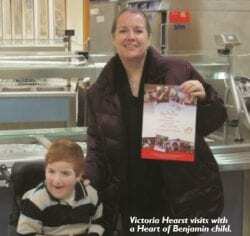 Victoria visited the Heart of Benjamin after-school program for special-needs children in Ofra, which at the time was functioning out of temporary caravans. She was warmly welcomed by Heart of Benjamin leaders, Mali and Yaakov Striegler who hosted Victoria and Sondra in their home for a barbeque dinner. In Tekoa they had dinner with Seth and Sherrie Mandel whose son Koby was murdered by terrorists at the height of the second Intifada.